I registered at 10:05 a.m. on Friday and got my confirmation email immediately. Wow! I was so excited! That runner-registration-high lasted about two hours. Than panic started to set in. I waited and waited. 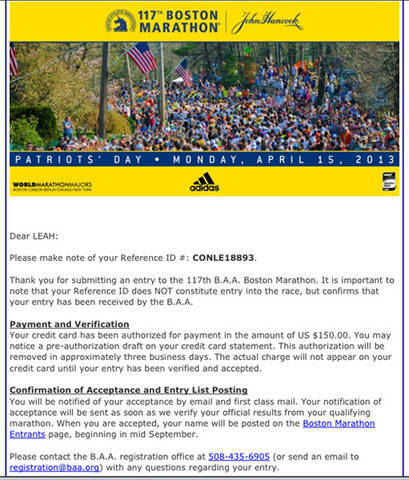 I could have ran another BQ marathon (3:38:04) and still waited. Then I could have ran my longest marathon (7:11:46) after running my fastest marathon and still nothing. My race was in drop down list on the registration form (Charlottesville) and the only thing that might be an issue is that the results has my state listed as Vi instead of VA. Could that really be what's holding this up?!? I know that I should be "IN" (-6:55), but I panic that they've decided not to accept my race for whatever reason. When there are people who get acceptance within an hour and others waiting days you are breeding an environment for paranoia overload! I wonder if they ever considered waiting to notify everyone in each group (-20, -10, -5) simultaneously rather than sending them out sporadically to ease this confusion about why someone got acceptance in an hr and someone else waited a week. I would have felt better if I knew everyone had to wait 2 weeks and we are guaranteed to hear on that date. Wondering if and when I could get the email is the worst. I waited 5 months from race day to registration day and every hour I don't get to see my name on that list of entrants is one less hour I can feel like I really "made it" to Boston. 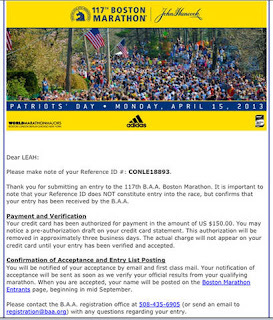 I would love to go to the Chicago Marathon in 3 weeks knowing I'm headed to Boston in 2013. Well, to be honest, I'm going there regardless because I have nonrefundable airline tickets and a hotel reservation. Ha!